To enable this feature, go to the Settings | Basics tab, select Enable for the transliteration option, and select your preferred language. The new language offerings will only be available on the new post editor, so make sure you upgrade to access the full set. This setting will affect all blogs on your account, similar to the Compose Mode setting. For more detailed information, please take a look at out transliteration article in our Help Center. Today we’re happy to expand our set of supported languages for the transliteration feature, that converts Roman characters into the corresponding alphabet of your choice. 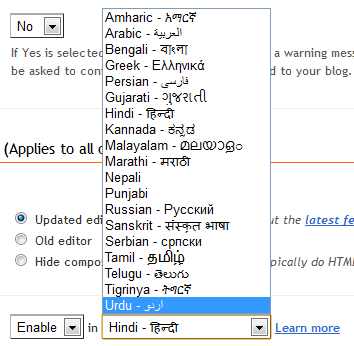 The nine newly-added languages brings the total to fourteen supported languages: Amharic, Arabic, Bengali, Greek, Persian, Gujarati, Kannada, Hindi, Malayalam, Marathi, Nepali, Punjabi, Russian, Sanskrit, Serbian, Tamil, Telugu, Tigrinya, and Urdu.